Sydney Airport has unveiled Australia’s first electric airport bus, as part of a $5 million investment in environmentally friendly ground transport technology. 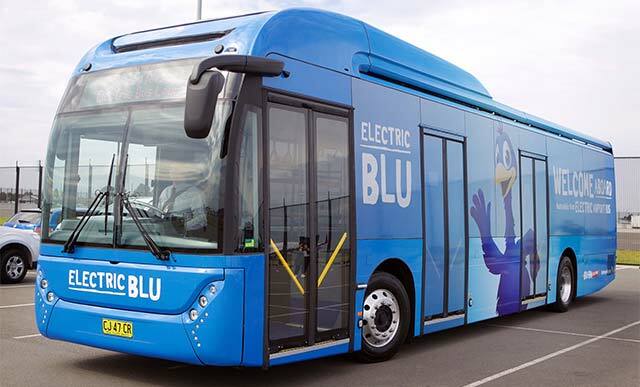 The Electric Blu bus is the first of a fleet of six electric buses to be operational by the end of this year, replacing the airport’s existing diesel bus fleet servicing the shuttle route between the T2/T3 terminal precinct and the Blu Emu Car Park. “We’re proud to be the first Australian airport to introduce electric buses to our Parking and Ground Transport operations, which will reduce our carbon footprint and enhance the passenger experience,” Managing Director and Chief Executive Officer Kerrie Mather said. The fleet of Blu Emu electric buses will deliver carbon emission reductions of approximately 160 tonnes per year and improve local air quality through zero tailpipe emissions. The fleet will also lower external noise levels, reduce waste fluids to zero and decrease the amount of toxic material generated during servicing. Electric Blu is a ‘Toro’ model electric bus, created by Carbridge in a joint venture with the world’s leading global electric bus manufacturer BYD. “Carbridge is delighted to deliver to Sydney Airport this country’s first electric airport bus and in partnership with BYD we are excited to be at the forefront of electric bus manufacturing in Australia,” Carbridge Chief Executive Officer Luke Todd said. The Electric Blu bus has a carrying capacity of 70 passengers, features purpose-designed luggage storage racks and has a range of 400km on a single charge. Sydney Airport has invested in charging stations and other ancillary equipment to support the deployment of the new electric bus fleet. The airport is also currently trialling electric cars as part of its ground transport fleet and investigating solar-powered charging stations to further decrease carbon emissions, while research and development is underway for recycling and reuse of batteries and other components.